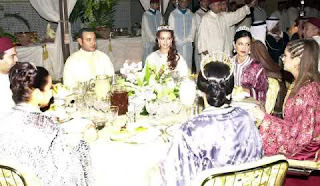 The marriage of Mohammed VI and Salma Bennani changed the history of royal marriage in Morocco. Traditionally, the wife of the king hasn't had a public role to play. 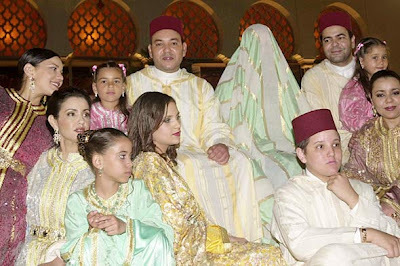 Moroccan kings have typically been polygamists prone to secret marriages to wives who remain private figures. The current king's own mother is not photographed, and there is no "queen consort" title in Morocco. Change came when Mohammed, who acceded the throne on the death of his father in 1999, announced his engagement. Not only did he announce that he was marrying, he identified his bride and released a picture of Salma Bennani, a Moroccan who worked in IT when they met at a party in 1999. They married in a private ceremony on March 21, 2002, and celebrated with days of grand celebrations in July (though they were initially postponed from April after fighting in the Middle East). The bride dressed traditionally, including donning a thick veil for a portion of the ceremonies. She let her signature red locks cascade down around her and topped them with a diamond meander tiara, though she has not been prone to tiara-wearing since. I encourage a look through the multiple parts of the video below for a peek at the wedding atmosphere. Salma, as I've said, has broken new ground in Morocco. She is publicly acknowledged, carries out public royal duties, and was given the title of princess. For his part, Mohammed has indicated that he will not take additional wives, and has given women's rights a push in the country. After ten years, the couple has two children: Crown Prince Moulay Hassan and Princess Lalla Khadija. What do you think of Salma's traditional wedding attire?